From pine strips 21 x 33 mm (s still nobler oak) create the four legs: 2 pieces in 520 mm length of the front, 2 pieces in 700 mm for the rear. In addition, a bit thinner strips 15 x 33 mm cut a total of 15 pieces in transverse length of 400 mm for the seat surface and the backrest. If all parts are then laid ever ordered, can be seen at a glance whether all lengths agree. Round off the ends of the legs with a jigsaw and rework with sandpaper. The crosspieces 9 for the rest provided 10 mm before the end with a 4 mm bore hole. The other 6 crosspieces for each seat 32 mm from the end of a borehole. 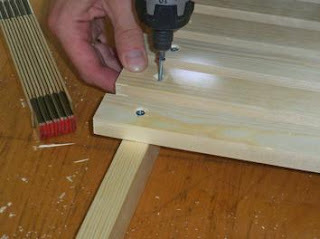 Treat the holes with a reamer so that the screw heads can be well sunk later. Then all the edges with sandpaper break (round). 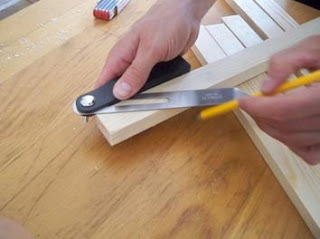 Although the grinding cost some time, but prevent later someone splinters tearing. The whole furniture summarizes thereby also pleasant. 1 / 3Wichtig: Pay attention to the squareness! 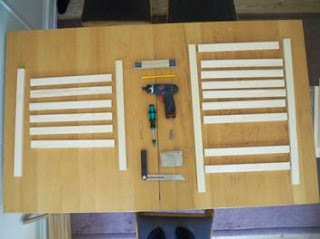 The two longer legs 70mm from the bottom of scribing and there assemble the first of the crosspieces with screw and glue. Puts on the other side the second crosspiece attach 155 mm from the lower edge. On the same side, finally assemble the third crosspiece on the upper end. Pay attention to the squareness. Turn the workpiece again and start on the first page edited rungs of the backrest from 100 mm from the top with 15 mm spacing and fix again with glue and screw. For equally spaced and parallel bars, I could just put one of the crosspieces upright as a lesson, because the bars were 15 mm thick indeed. The finished backrest from the side. The backrest and a single crosspiece sitting on the side in the picture above, two further cross members opposite. The seat works much like the back and was about even easier by hand. A special feature here, however, were below the chamfered legs, which are needed for a stable stand. I have used it a bevel, so an adjustable angle on einVerhältnis of 3: 6 has been set. Then just touch on slope and cut with a jigsaw. Flush banding The first crosspiece of the seat with the front edge and the next 270 mm from the edge and screw. 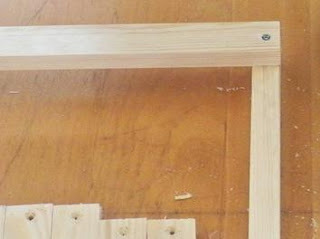 Caution: This time, pay attention to an overhang of 22 mm on each side! 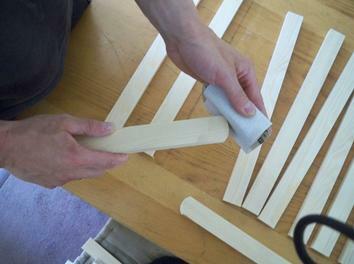 It results from the used strip thickness of 21 mm plus 1 mm for the free play of both chair parts. The still remaining crosspieces evenly mounted on the seat. When supernatant everything done right with the 22 mm, the seat can now clean and without jamming slide it into the part of the backrest. 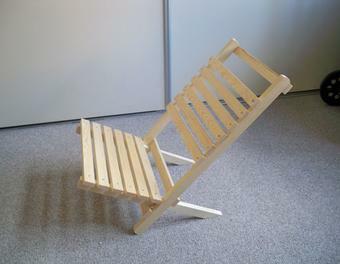 The sitting posture in the chair is similar to a deck chair, and you can also fine him for use in the garden. A textile foam pad is however recommended for longer "sessions". At a wood preservative, we have deliberately omitted, however, which is why we have to be careful now that the chair does not remain outside in the rain. That would be when purchased may be different, but real wood furniture in the garden market also have a completely different price than our jewel. Who decides for a replica with wood preservatives, should emphasize the woods after cutting but before installation at least 2 times with wood preservatives and each plan at least one day waiting period to drying.